This video is the second in a series released by Love of Art Productions. Making Tongs shows the blacksmith making three different styles of tong joints with three different tong heads. First we see the Twisted Joint/Scrolling Head tong, then the Traditional Joint/ Wolf-jaw tong and finally the "Champion" Joint /Bolt Head tong. 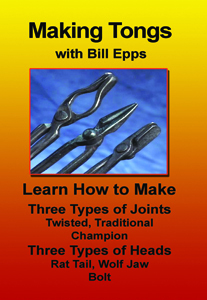 Epps also shows a variety of other specialty tongs he has made, and discusses the importance of a blacksmith being able to make his own tools. Tips such as how to quench moving parts will help the student blacksmith avoid frustrating mistakes in his own shop. The viewer sees the artist using a power hammer in this video to draw out tool handles, as well. As in the first video, Forged Animal Heads, the directors use careful editing, good voice-over enhancement and a "chalkboard" segment before every piece demonstrated, to help the viewer duplicate Epps' techniques. Good production value and Epps' casual country wit make this a video that every smith will want to have in his or her how-to library.